I am extremely pleased to offer you an interview with that mysterious, infamous Dragon that frequents the chat rooms and tramps about MacJams leaving enticing comments and suggestions on the amazing music published there! Drakonis, (aka Eduard) was on one of the first people I came in contact with after joining MacJams and he should be given the title “MacJams Ambassador”, because he is wonderful at making a new comer feel at home in a strange place… well that is until you realize he’s a dragon and his favorite meal is MacJams newcomer stew… (just kidding… I don’t think he’s ever made MacJams newcomer stew… yet!). Allow me to present the incredibly talented, witty, friendly, and generally an all around great guy, Drakonis! Please see his artist page for an incredible catalogue of music. Drakonis! Let’s see, I am Eduard… and yes that is the German/Russian spelling with a “U”, and it is never “Ed” or “Eddie” 🙂 I have enjoyed living in the San Diego, California (USA) area all my life, despite the rather un-interesting weather here. Of course, the earthquakes and wildfires do provide occasional excitement. I’ve always had an insatiable curiosity about everything. As a kid I read books on insects, science, the Loch Ness monster, sci-fi… I love hiking, photography and videotaping the world around me. My dad was an electronics engineer, so by 8 years old, I was sitting in the garage with him, building my own electronic circuits with blinky lights and squawking speaker noises. I even got into CB/Shortwave/Ham radio. But by 15, my mom got tired of me flicking molten solder and burning holes in my pants, so I switched to computer programming instead. I had a 15 year “practice marriage” and have two wonderful children. After the divorce, I fell in love with and married the most wonderful romantic lady in the world. We have fun exploring the world together, but lately due to the high cost of travel, we are content to go to local Renaissance festivals or hike, or stay home and read Terry Pratchett novels to each other. Someday we would like to go back and visit Vienna again, and also Budapest and Prague. What kind of work do you do for a living? I have a bachelor of science degree in computer science, so when I take off this dragon suit, I become “Clark Kent”, mild-mannered software engineer. I have written software for factory automation systems (controlling conveyor belts and part-carousel robots), human-language-translation software (English/German/French/Spanish), Reading/Math educational software for primary school computer labs, children’s game software (ever heard of Gryphon Software’s “Superman Activity Center”? Oh, the easter eggs I created…), and even personal income-tax preparation software. I have also written some freeware and sold some shareware as a hobby. For the Geekophiles, over the years I learned BASIC, FORTH and FORTRAN, assembler, Pascal, C, Java, C++, and Objective C. I have worked on Apple II, IBM PCs, HP Minicomputers, Suns, but mostly love working on Macintosh. I was co-inventor on a couple of patents. I almost never play computer games, I am too busy creating things and learning stuff. You’ve been into 3D graphics for sometime and written a book on ray-tracing. Tell us about this interest. I’ve always enjoyed how mathematics could be twisted into making intricate art, especially when I could get computers to do the hard work of plotting curves and shapes for me. Of course, fractals totally captivated me too. In my 20’s, a friend asked if I wanted to help him with this world-wide collaborative team on CompuServe (before “open source projects” were really invented) where this team of over 20 programmers/writers/artists were building this freeware 3D “ray tracer” for Macs, Ataris, Unix minis, IBM PCs, etc. called POV-Ray. I saw the photo-realistic images you could make with it, http://mac.povray.org/art_artists/esp/memory1.html and I was hooked! I helped with the Mac side of the project for 8 years in my spare time, writing software, doing tech support, making friends around the world… it was a labor of love. About 3 years into the project, I was e-mailed from a book publishing company out of the blue, asking if I would be interested in writing a book explaining how to use this software to create these ray traced images on the Mac. Before I could think, I had said “YES!” About a month later, after the adrenaline wore off, I began to realize that writing a book is a LOT of work. By the way, it is best not to take on a project like this with a pregnant wife and a major house remodel going on. But I learned a lot about writing and publishing, made lots of friends, and sold 5,000 copies before the little publishing company got eaten by a big publishing company, and the book was discontinued. What about the movies you’ve created using 3D graphics? Tell us about the creation process. Where do you get the inspirations for them? Inspirations for my movies come from nature, fantasy, dreams, aspirations, which I then mix together. My current 2+ year project “Fractal Serenity”, (teaser/trailer is here), came from a single hauntingly weird dream that recurred several times. It was so vivid that I had to jot down the story and the twisted imagery in a notebook. I have been working on capturing it all in a short 3D film that shows a very alien world, but one where the viewer begins to make connections to their own world. I hope to finish it and sell it on DVD (along with a behind-the-scenes “Making-of” segment too.) Last year I sold a number of my “Dance of the Technoids” music video DVDs. That was great fun! Thanks again to Macjammer Ian Beardsley for his great Techno-Flamenco guitar solo in there, and to Alimar & Co. of “The Lost Records” for managing production/sales. There is a lot of talk of dragons when you are around. Are you really a dragon masquerading as a human? What is your fascination with dragons? I was afraid you were going to ask that… ah, now the truth will out. Does your work or what you do at work help you to envision, compose or create music? If so how? Not lately, not directly, no. Work is paying the bills and keeping my programming skills sharp. As a side hobby, I enjoy tinkering with software that can help me write music, and create weird waveforms and sounds. But mostly, work is stressful and tiring, and I come home to unwind. I find the creative process of writing music, and even critiquing others’ music, very therapeutic and invigorating. Work stimulates my left brain, and I need music to stimulate my right brain, otherwise I get lopsided and grumpy. My parents mostly played classical music LPs in the house, so I grew up listening to Bach, Beethoven, Sibelius, Stravinsky, and sometimes the Kingston Trio, Limelighters, Spike Jones, Tom Lehrer, and PDQ Bach for fun. We would sometimes go to classical music concerts, but I never have taken any formal music theory classes. I just “doodle with triads” until the chords fit. It is only in the past several years after finding Macjams (and getting support from my wife to pursue this hobby), that I have started studying theory on-line and in books a bit in my spare time. As a teenager I loved a lot of synthesizer and rock bands, Pink Floyd, The Cars, Tears for Fears, Switched on Bach, Tangerine Dream, etc. I also loved international folk music from other countries (Japan, Peru, Russia, Ireland.) But the classical influence is the strongest, I think. You’ve told me before that you are a composer, not a performer. Why do you say that? Have you ever played in a band? Tell us about it. In junior high school, after listening to Prokofiev’s “Peter and the Wolf” a bazillion times, I wanted to take band classes and learn to play the french horn for the “wolf” part… I absolutely loved its strong mellow sound. But, I was cursed with an overbite, and got braces instead. So instead of ripping up both lips with the horn and braces, I set my sights on “the cat” and got a Bb clarinet instead. This instrument allowed me to sit across from all the cute flute players. I played and tried to practice for 3 years, but never did very well at it. I did learn to read music, and gained great appreciation for real musicians. I still love going to classical music concerts and intently watching the performers, even the flute players. 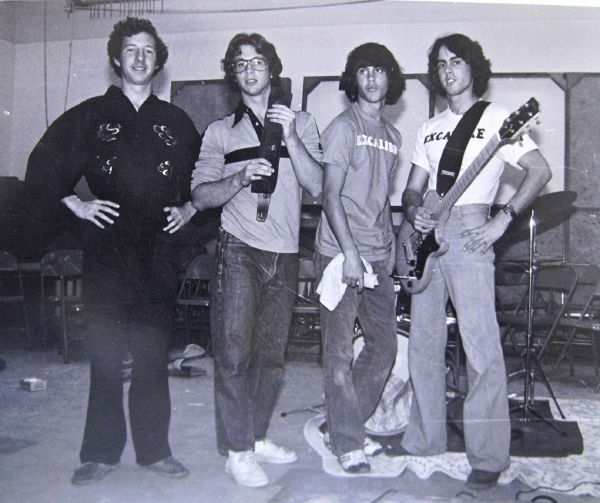 In high school, my best friend Dave, (far right in the picture and in politics) created a rock band called Excalibre (I’m in black on the left.) He was lead guitarist, and I was the “Sound guy and Roadie”, and there was a bassist, drummer, and eventually a lead singer. It lasted about 6 months and 2 gigs, and I learned one very important lesson. If you are in charge of sound levels, and you have a (primadonna) lead singer and (primadonna) lead guitarist, make sure to put big knobs on the microphone amplifier and the guitar amplifier that BOTH go up to 11! That keeps them both happy. Composing and performing are two very different talents. Overall, I’m a lot better at quietly writing music behind the scenes. I’m not comfortable getting up in front of a crowd and performing, and I don’t know how to play any instruments, not even piano, and I cannot sing. So I read up on the instruments and transposition, and try to write fun music for other people to play. Tell us a little about your music setup, both software and hardware, and how you go about creating music. Ah, you want the boring stuff now. The “Dragon’s Den” is my computer area and slowly-growing audio/video studio, which competes with my wife’s spinning wheels and home-spun yarn stashes. I currently have a Macintosh Pro Intel Dual core tower (5 GB RAM), FocusRite Saffire Firewire interface for MIDI and for my AKG Perception condenser microphone. I have a funky old Radio Shack keyboard/synthesizer for capturing ideas via keyboard. For software, I mainly use a powerful shareware notation/scoring software called Harmony Assistant. I have tunes floating around in my head all the time, so I usually capture the basic tune in H.A. first. I then add harmony parts, choose instruments for each part, add repeats, etc. Then when it is “done” being written, I can export to MIDI, or print really nice looking sheet music. I usually then export it (via a MIDI file) to Apple’s GarageBand, and assign better-sounding instruments to the tracks using my favorite Symphony Jampack (sampled instruments.) I sometimes use Audacity or Amadeus (audio editors) to create or add strange sounds and special effects. Then comes the laborious tweaking of volume curves, adding effects, equalizing tracks, etc… often going back to the original Harmony Assistant file and rewriting parts, re-exporting to GarageBand, and tweaking some more. Sometimes this takes a few days or weeks, but most of my songs have been sitting half-completed for years, and only now am I starting to feel I know enough about music composition to dig through them and start turning them into something more interesting than the 8 bars of a melody idea. Of course I keep humming up new ideas too. I grew up listening to crystal clear classical music, and even the rock bands I listened to, I usually preferred clean studio bands (The Cars, Tears for Fears, Beatles, etc.) I find the distorted overdriven electric guitars of grunge and heavy metal to be a little outside my comfort zone, I’m afraid. So, that said, I tend to write and mix my music so every instrument is distinct and clear sounding. I spend a lot of time thinking about what octave range different instruments will play in so they don’t stomp on each other (I’ve been recently slowly reading through Rimsky-Korsakav’s book on orchestration for help.) When I mix, I check each track to see if there are pitch or temporal overlaps, and try to soften the overlap frequencies to keep the tracks separated. I also carefully place (pan) each instrument in a slightly different spot so they sound physically separate. With lots of tracks, this can be confusing to keep straight… and since I tend to think spatially, I often draw little pictures of where things should go. I believe a piece of music should have lots of bass, lots of treble, lots of melody, and lots of emotion. I try to make those 4 things stand out. I still have a lot to learn though, and I keep learning cool stuff from other helpful people at Macjams. Nothing big, and I am already having some things happen I never dreamed would happen! I am writing music that is being listened to and played by musicians around the world, and sharing and collaborating, sheesh, what more could anyone dream of? The one thing I would like to be able to accomplish is to have enough knowledge and time to write some real symphony-length pieces, and see them performed live, even by a local high school or college, now that would be cool! I am getting there, note by note. Luckily dragons live for thousands of years, so I have time. Uh oh… I don’t know if I can pin down any specific inspirations. I love the mathematical complexity of Bach, the emotional ferocity and depth of Beethoven, the writing for brass of Sibelius, the raw angular power of Stravinsky. I love American ragtime, Spanish flamenco, Loreena McKennitt and Enya, Tangerine Dream and Pink Floyd, The Cars, Foreigner and Blue Oyster Cult, Simon and Garfunkel… and I also adore humor in music (and in life.) Ambient and New Age is great from time to time. I have a quiet dark side too, and secretly enjoy a little goth and darkwave now and then. Lately, I’ve been exponentially expanding my appreciation of styles by listening to Macjammers’ music in all sorts of genres. So as you can see, my brain is a big mish-mash of styles, and they all inspire me in one way or another. Absolutely. I love learning how to use the tools that are around me. There’s no way I could afford to go to a music academy, or have an orchestra at my disposal. So having computers that could store my music compositions and could synthesize sounds to play it back… that just excited me and got me more interested in writing music. But the computer has also made it easier to melt other artistic ideas (like photography and 3D animation) together with music, so I cannot imagine ever getting bored. But then, the internet has also created ways for me to make friends and share and help with musical projects with others around the world. And since I have this secret desire for everyone to realize that we are ALL people, just like each other, no matter what country we are in… I think music and the internet create a universal language and communication channel to move us closer to where everyone is at peace. Tell us your thoughts on MacJams. Are there any things you would like to see done differently? You know, I have a bit of sympathy for the admins here. Since I participated in the POV-Ray “spare-time-free-service for others” project for 8 years, and often got yelled at for not doing enough fast enough for everyone, for free… I think the admins have put together a really great “idea”, and the idea is working really well (bringing talented people together to create and share music.) Sure, the web site needs a lot of work, but that is a big tricky problem: running a web site is always a lot of work, and very few people know all the behind-the-scenes effort it takes just to keep it going, much less, updating it while it is being used heavily. Unfortunately, I think that throwing money at the problem would instantly change the character of Macjams, and would likely kill it. Of course, I would love to have the admins be well-off enough to spend a little more time moving us toward MJ version 2.0, with integrated artist blogs, videos, playlists, and versioned songs, but you know, I’m here mostly for the people-connections and learning how to write music that others like, and that’s working quite well for me here. The bugs and partly-updated web design is a bit daunting, and turns a lot of people off though, and I too would hope that it gets further along soon, and wish we users could help in some way. But letting other people mess with the website and manage the bugs/changes that are created is sometimes more work than doing it yourself. Probably nothing very insightful or exciting. I have found that the best way to get along here is to remember that you are only seeing a small piece of another MJer’s life, and so, always be respectful, patient, and helpful. Who knows what other things are going on with the person you are chatting with or leaving comments for… personal or health or financial crisis, death in the family… so play nice! Mark, one of the reasons that Macjams is such a warm and wonderfully addictive place to hang out is that it is made up of people who roll up their shirtsleeves and help make fun things happen. This “Macjammer’s Blog” for example… its a great way to learn more about each other. I have been reading every one that has come out, and have come to know many Macjammers a lot better. So, I want to thank you deeply for picking this idea up and working so hard to keep it going. I find them all super-interesting, and appreciate your efforts! I also want to say again that I keep learning great techniques, tips on equipment, and ideas for new music styles from people here, so I am always trying to give back with what I hope are helpful critiques of their music, what is good and what could be improved… because that is how I learned to improve. I also want to thank the other two secret Macjammer-members of KSA (Kitchen Sink Anon.) who helped me break the habit of trying to throw everything into my compositions… we keep an eye on each other and blow the whistle if we see each other slipping back into old habits! Only a few? These questions always get me in trouble, so I will wiggle into my dragon suit and cheat… remember that old joke about the Genie who grants you three wishes, so you make sure that your third wish is “to have a thousand more wishes”? 1. One of the first Macjammers whose music I heard and fell in love with was MissChaos. I likely would have wandered away from Macjams if it were not for her captivatingly emotional music and her friendship. 2. Roxylee is a very close friend whom I knew long before Macjams, and greatly enjoy her wit and wonderful singing. After I joined Macjams, I bugged her constantly to join up too and learn Garageband and get a microphone, etc. I guess I pleaded enough, because now she is here. 3. And for my last wish, I choose… all the other artists I have in my “Favorites” list… they are spectacular, and inspire me constantly! My iPod is 80% Macjammers now. Move over, Beethoven! Border Merger – Tearing down the Waltz: A romantic musical gift to my wife, with a real talented Russian Jazz trumpeter playing from my sheet music. Ember Rekindled: A dark ambient moody piece, posted as an open collaboration… any Macjammer is invited to contact me for the GarageBand and MIDI files, and alter this in any way they want to create a wildly different take on the original. There have been over 36 variants so far, absolutely amazingly different from each other. Caroline’s Bear Rag (aka Lickety Split rag): This is a bouncy ragtime piece for piano, which I later renamed and dedicated to the always-bouncy Caroline and her bear. Ahhh… the long-awaited MacDrak interview. 🙂 Eduard has been a constant friend for years, and yes, he kept prodding me to use Garageband and try my hand at recording, then to be brave enough to post at MacJams. I’m so glad he persevered. Thank you, Eduard. It is great that everyone can now see the many talents you have, in addition to the fact that you are one of the most helpful and encouraging people ever to grace this place. Your music is perfectly crafted, and we look forward to seeing your computer generated movies and videos of your adventures. you contribute selflessly and generously, and I’m glad you are getting a fraction of the recognition you deserve. One question: How does a dragon drive on the freeway without causing major pileups? What a great interview! What a great pal! Eduard, you have a fascinating story… the places you’ve been, the things you’ve accomplished. Well-deserved accolades! MacDrak? Hee hee… sounds like a meal from SmackDonalds! Now for a limited time only… The MacDrak for only 99 cents! This was an informative and helpful interview. Drakonis is, in fact, a goodwill ambassador and he does practice what he preaches. Most of all, he is a kind and fun person. There are many laughs to be had in the chatroom, but you must keep on your toes because Eduard is a magnificent punster with a great sense of humor to back up his wordplay. His music is finely crafted and it definitely stays in the listener’s consciousness. Eduard is an inspiration and a friend. I love Mac Jams because it is Drakonis’ neighborhood. Thanks, Mark for bringing some insight into the wonder that is Eduard.